For nearly as long as there’s been an Internet, fans have been contributing to the nine inch nails experience. There’s something about the music that seems to inspire a devotional following (probably has to do with expressions of angst, contempt and alienation wrapped appealing pop sensibilities). Youthful rebelliousness and antiestablishmentism runs deep through both camps. Indeed, the rise of nin and the net seems to have coincided perfectly with each other. There were discussions on Usenet about Pretty Hate Machine being one of the best albums of the year in 1989 and the earliest mention of a nine inch nails web site that I could find is dated Nov 1, 1994, shortly after the net was opened to the public. 1994, of course, was the year the The Downward Spiral took the world by storm, reaching #2 on the Billboard Charts and exposing nin to the mainstream. Long story short: Reznor took five years to release another album and while lost in the wilderness, the steadfast fanbase incubated around the Internet. Fansites came and went, trading bootlegs and rumors and tracking the handful of singles and soundtrack songs released in the interim. By the time 1999’s The Fragile release cycle began, Internet culture had matured quiet a bit. MP3’s and broadband were just starting to be mentioned in mainstream, but the leading-edge nails fans had already adopted them. I downloaded my first fan remixes sometime in the 99-00 winter and some of them were really good (like The Day The World Went Away (peppy by ignorantLOSER). download it). On the official front, Trent made several remixes and exclusive tracks available at the nine inch nails website. There was even a remix contest held for the song The Big Come Down (the winner can be found here). Fast forward another five years. The Internet and computer technology had advanced quite a bit further. The album With Teeth was released in the spring of 2005 and a month later, Trent posted the source files to the first single The Hand That Feeds to his website in Apple’s Garageband format, officially sanctioning home-brewed remixes of the song. Websites sprang up immediately to catalog and share the fan-created materials. Which brings me to today. One of the predominant trends on the Internet is, to be sure, social networking and inter-site integration (some call it “web 2.0”). What happens when you mix web 2.0 with the nine inch nails online ethos? Taking the home remix concept a step further, Trent Reznor has put together a site where anyone can sign up, listen to, vote on, make comments about and download nine inch nails remixes, both official (as in previously-released on CD) and fan made. It’s freakin huge. The more industrious fans can download master tracks and make their own remixes for community evaluation and sharing. The site combines the nine inch nails community and do-it-yourself artistry with a heavy dose of modern social media technology. The entire site is built in Flash and follows the graphic spirit typical of a nine inch nails presentation. Music can be selected from a playlist showing the latest top rated songs or you can search or browse for a particular piece. When browsing, you can create your own custom playlists. I started to put together a complete instrumental version of Year Zero before I realized that Trent had already done it for me. Other available playlists include Top Rated Fan Mixes, Most Commented, Newest, and Most Listened to, among others. Once a song is selected, it begins playing in the browser and the song’s curriculum vitae is displayed along with it. If you enjoy what you hear, there’s a “download mp3” button next to the rating number. 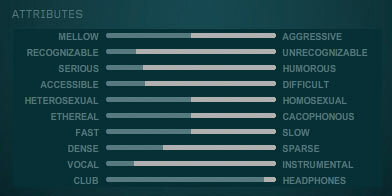 Users can also assign attributes to songs based on various continua such mellow vs aggressive or dense vs sparse. Playlists as well as individual remixes can be shared. Playlists via RSS feed so you can publish your favorite tracks or keep tails on a favorite remixer. Individual songs can be shared via URL. Here is a decent remix of The Beginning of the End. The only thing that’s missing is embedable player, a la YouTube, for putting the mixes on your own site. There is one thing I can’t help but grumble about (but good-naturedly): all those rare and unreleased songs for the downloadin’. Being the nails fan that I am, I’ve spent more a decade keeping up with all the loose-ended ephemera of the catalog. Imports, promos, versions, bootlegs and anything else rare and obscure. After all the work and effort, to my (light-hearted) chagrin, I come to find that a lot of it is now free for the taking. It took me six and a half years to find a copy of the Aphrodite remix of The Perfect Drug, but you can have it just by clicking on this link. But hey, the fact that it’s available at all is pretty freakin cool. So Amazon recently threw its hat into the thunderdome of online digital music sales. The store’s big brand name and huge retail operation instantly make it one of the top tier marts for digital music. As Amazon MP3 is seen primarily as a challenger to the iTunes Store’s throne, I originally wanted to do a compare and contrast with that gorilla, but later thought that unfair to eMusic, who consistently claims to be the second largest online store on the net. The iTunes Store has more than enough going for it that an equilibrium will eventually be met with whatever competition comes its way. eMusic, however, might be quite vulnerable to Amazon’s might and muscle. But just how does that muscle shape up? As the store’s name suggests, Amazon MP3 provides music in the MP3 format. MP3 is incompatible with any type of rights management and the most notable claim of AMZMP3 is the freedom of the file format it is willing to sell. MP3s, of course, work on virtually all portable devices. Amazon MP3’s also pitches its files as being high quality. The site claims to supply a very healthy bitate of 256kbps for its downloads, but the files I’ve purchased have averaged 214 (VBR) kbps. Though they sound fine to my ears, it is less than the site advertises. Getting info on the file tells me that it was encoded using LAME 3.97. Like Amazon, eMusic provides free and open MP3 files and has been doing so since 2003. The MP3s are encoded around 192kbps (VBR) using LAME 3.92. The music sounds great. The iTunes Store has been the spearhead in the adoption of the AAC format, selling AAC encoded files since the store’s 2003 inception. AAC is billed as a successor to MP3 and is particularly noted for sounding better at lower bitrates. At the time of this writing, the iTunes Store is providing two flavors of AAC. The standard encoding is 128kbps, which to its credit sounds pretty good. The store benefits from having the songs encoded from the original master recordings, rather than being ripped from a CD. Throughout much of the store’s history, however, Apple has been forced by its contracts with record labels to include the much-criticized and oft-despised rights management, FairPlay, on all song downloads. Most of the songs it sell come packaged this way. Recently though, the store has made moves to free its music from those restrictions. The iTunes Plus service sells songs with no DRM attached and doubles the bitrate to 256kbps. There’s a lot of debate about the merits of AAC vs MP3 at higher bitrates, so the benefit of the increase may not be that significant, but surely, it can’t hurt. Currently, about 1/3 of the store’s inventory is offered via iTunes Plus. Winner: 3-way tie (with edge to Amazon and eMusic). The files supplied by each store, while not lossless, sound quite adequate for the majority of listening applications and music systems. iTunes loses a couple points for the continued existence of FairPlay, but the way things are trending, it probably won’t be around for much longer. Update 28 March 2009: Apple has announced that by April 2009, 100% of its music content will be DRM-free. It that comes to pass, then there really will be little to debate about format choice. All three stores will be using files that are compatible with a large number and wide range of players and hardware. Each store likes to boast about its large catalogue. iTunes is by far the largest with about six million songs to choose from. eMusic and Amazon both claim to offer more than two million songs each (Playlistmag says eMusic has 2.7 million UPDATE 11/7: Macworld reports that eMusic now stores 3 million songs in its catalogue, while Amazon’s complete list shows 2,479,112 at the time of this writing). Impressive numbers all around, but catalogue size doesn’t mean squat if it doesn’t have the songs you’re looking for. So, I went through the music libraries of three people and randomly choose 20 songs from each. I then looked for those songs on all three services, giving one point for songs on the album I was searching for or half a point for the song in another context (soundtrack, compilation, greatest hits, etc). The iTunes Store is easily the champion in this contest, besting its two rivals combined. Of the 60 songs searched, iTunes scored 46 points, Amazon finished with 20 and eMusic ranked in with 14.5. Within those results, there were only 2 instances where either AMZMP3 or eMusic had a song that iTunes did not and 5 instances where eMusic provided a song that Amazon did not. In total, there were 10 songs that none of the stores carried in their inventory. But besides the run-of-the-mill catalogue, each store has its selectional perks. iTunes offers tons of exclusive content, such as its iTunes Originals series, celebrity playlists or the AOL Sessions series. eMusic has an extensive selection of “eMusic Only” releases, many of them full live concerts. The site also hosts the world’s largest collection of DRM-free music, which eMusic notes come from 20,000+ independent labels. However, the iTunes Store and Amazon are both gaining in that respect. What you won’t find, however, is any of the majors, which is a bit ironic considering that Universal used to own the place. In contrast to eMusic and iTunes, Amazon MP3 is lacking in the exclusives department. There’s no “Amazon Presents…” or the like, just search-and-download. In a notable coup, however, AMZMP3 is the first and only store to offer digital downloads of Radiohead’s albums (plus one single for the completeists out there). Though the band’s label, EMI, also participates in Apple’s iTunes Plus program, Radiohead only wants to sell complete albums, which violate Apple’s policy to offer track-only purchases. Thus, OK Computer at Amazon, but not at iTunes. Update 3 June 2008: Radiohead’s complete catalog is now also available DRM-free from iTunes. Winner: Each store offers a reason to shop there, but at the end of the day, it’s the iTunes Store that will most likely be selling what you’re looking to buy. In typical Apple fashion, the iTunes Store screams ease of use. The storefront is built into the iTunes desktop app, making for one stop shopping. Apple has gone to great lengths to integrate the offline library management functions of the program with the online sales environment. The ubiquitous “iTunes Store” arrows and the “Minibrowser” might be a little intrusive, but those can be turned off. Once in the store, finding songs/albums/artists is trivial; just type it into the search bar, though most of the time you have to sort through movies/tv shows/podcasts/etc in the results. The store does a pretty good job of segregating the various types of media. iTunes falters when it comes to the exploratory level. In the four years since its launch, I’ve never found it all that comfortable or appealing to browse the place for an extended period of time. Like almost all online shoppes, the iTunes Store allows users to leave feedback, ratings and comments about albums. It also provides rudimentary recommendations in the form of “People who bought X also bought Y.” Users can also contribute to the store via iMixes, compilations put together by individuals and submitted to the store. However, the presentation is pretty sparse and there’s minimal “social aspects” to them, i.e. you can see what another person has rated or look at their iMixes, but you can’t “befriend” them or interact or see recommendations based on tastes you might have in common. Once purchased, songs download straight into your library. It’s seamless. But be sure to make a backup of everything you buy. Apple only allows you to download the song one time, though if a catastrophic event wipes out your collection, the store does permit an unpublicized one-time re-download of your purchase history. Some songs, usually determined by length, are not available as a single download, but must be purchased as part of an album. That can be a drag when you just want the one song. eMusic’s storefront is HTML-based. The store can be accessed and songs downloaded from any web browser. Recently though, the company released eMusic Remote as a way to integrate the online store with the desktop. The app runs on Mac/Win/Lin and is based on the Mozilla browser. Think: iTunes-Store-inside-Firefox. eMusic Remote provides an easy way to navigate the store and manage downloads, which can automatically be added to your iTunes library, should you so desire. The site’s search feature could use some vast improvements. Often, the results it returns are far too many, especially for simple queries, and they don’t seem to be prioritized and are not sub-sortable. Sometimes, I find it easier to do a Google site search instead: site:emusic.com. Previewing music comes in the form of downloadable m4u playlist files, which can be opened by iTunes or Quicktime Player. 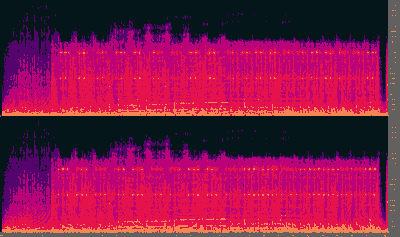 The process can be tedious for single tracks, but is really quite nice for checking out complete albums. Though, I’d rather they switched to Flash-based, in-browser previewing. UPDATE 04/17/08: Hooray! eMusic recently switched to an in-browser sample preview system. It greatly improves the ability to get a taste for a song/band/album before deciding to buy. In contrast to iTunes, eMusic’s social aspects are more robust. While similar in theory to what iTunes does, the execution is better. Each album’s page shows any reviews that members have written; that’s not special. But, where iTunes says “People who bought X also bought Y,” eMusic is more specific, giving recommendations based on what a handful of particular fans also enjoy. These make great springboards for further exploration. Also, an album’s page shows which users’ ‘playlists’ it appears on. Akin to iMixes, a user playlist can be whatever the author wants it to be. A playlist can be as simple as someone’s public bookmarks, or as indepth and voluminous as “80+ Reasons Why Japan Rules,” much like Amazon’s Listmania. One of the best music discovery tools I’ve run across on any platform is eMusic’s Neighbors screen. It shows fellow music fans with similar tastes. Hover over a shared artist and get recommendations based on that artist. 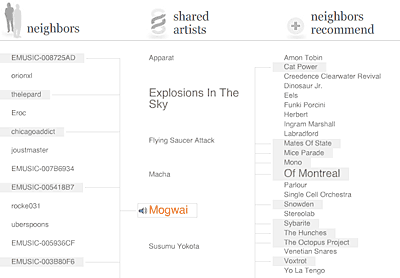 On my current screen, based on my interest in Mogwai, I have five neighbors telling me to check out Cat Power, Of Montreal, and eight other artists. Using this tool, I’ve found a number of new and interesting bands based on my intersections with my musical neighbors. eMusic, unlike iTunes, offers no restrictions on the number of times you can download a purchase. Hard drive melt? Just log into your history a grab it again. Also, unlike iTunes, eMusic has no restriction on songs based on length. There are no “album only” purchases. Every song, even a 30 minute opus, is available as a single purchase. AMZMP3, like eMusic, is browser-based with both direct download for singles and a desktop app for grabbing albums. The company knows how to run a web store, and its expertise shows. If results are available, a search will return a list of artists, albums and song that match. Songs can be previewed immediately via a nifty on-page Flash-based system, or more details on the album can found on the album’s page, which integrates the feedback, reviews and ratings from the physical CD’s entry in the vast AMZ database. Likewise, if MP3s are available, the option to buy them appear on the actual physical CD’s page. A useful gimmick that doesn’t seem to be in place though is, “Buy a CD, download MP3 immediately” type bundles. I suspect that would result in a fair amount of up-selling. Getting the actual music files is straightforward enough. For single songs, click the “Buy MP3” button, confirm payment and a single MP3 will be all yours for the downloadin’. Whole albums require the Amazon MP3 Downloader program. When purchasing an album, a reference file is downloaded to the desktop. That reference file tells the Downloader which album to retrieve. Then the music begins to flow. When finished, the app will auto add to iTunes if requested. The process requires a couple extra steps, but it works. Like iTunes, some music at AMZMP3 is album only, though it’s hard to know what or why. Those Radiohead albums for example, no individual songs can be purchased. The length of the song isn’t necessarily a factor. There are some 17 and 18 minute-long Mogwai tracks available separately, while at least one 11 minute Sonic Youth song is album only. Adding to the confusion is the store’s somewhat perplexing price structure. Overall though, the site is still considered to be “public beta,” so we can guess that it will improve with time. Winner: Each services is pretty much on par with the others on the ease-of-use front. None have a particularly show-stopping difficulty. iTunes gets points for the all-in-one solution, while Amazon is a known quantity that now extends to MP3 sales. eMusic’s search can be challenging, but its re-download policy and music discovery tools make it very appealing to the adventurous. The iTunes Store charges a flat $0.99 per song for individual tracks. Albums cost the sum of all songs, or $9.99, whichever is lower. It’s the same way throughout the store; there are no variations. Unlike iTunes, Amazon charges a variable price for downloads. At launch, Amazon’s typical price per song is $0.89, though some are $0.99. Most complete albums run $4.95 to $9.99, though I’ve not figured out how those prices are computed. Sonic Youth’s A Thousand Leaves is 11 songs at $0.99 each or $7.97 for the whole album, a difference of $2.92. Pink Floyd’s The Wall is currently $8.99 for all 26 songs ($0.35 vs $0.99 a piece), whereas Dark Side of the Moon has some songs for $0.89, others for $0.99, or $7.99 for the album, a difference of only $0.62. It doesn’t make much sense, but in some cases, you might find a better deal than the iTunes Store. eMusic’s business model is different than the pay-per-track services of Amazon and iTunes. Similar to the Netflix model, subscribers pay for a membership plan to access a certain number of downloads per 30-day cycle, rather than paying for songs individually. In my case, I pay $14.95 for 50 downloads every thirty days. If I download all 50 songs, I end up spending just $0.30 per song. There are more extensive bulk plans that will bring the price down to $0.25 per song. Also, the length of the song doesn’t matter; a 30 minute epic track costs just one download credit, as does a 30 second interlude. Maximizing the value of one’s subscription requires diligence however. It’s never happened to me personally, but if one forgets or is too busy to retrieve their current downloads, well then, they get squat for their $15. In my case, the worst I’ve ever done is have 6 credits left at the end of the cycle. I’m usually plagued by the *other* subscription conundrum: Wanting a 10-song album, with only four credits until the next refresh. Most of the time, I solve this dilemma by grabbing the first four songs, bookmarking the album in my “save for later” area, then return first thing after the refresh (I have an iCal reminder tell me when it’s time). Alternately, I find eMusic to be an inexpensive way of exploring classical music. Winner: On price alone, eMusic wins, provided you take full advantage of your subscription. With the $14.95 plan, you’ll be on par with iTunes as long as you download at least 15 songs per cycle. At this time, Amazon is also undercutting iTunes on price. This could change after the honeymoon period, as more popular songs might be priced higher than $0.99, but for now, iTunes is the loser on the money factor. Songs from all three stores come with comprehensive ID3 tags, providing song name, artists, album, genre, etc. AMZMP3 provides high-quality album art embedded in the file, while iTunes supplies it in a separate sidecar file. eMusic will download a jpeg along with the MP3s, but it must be manually added to the files. eMusic’s jpeg however is a pitifully small 150 x 150 pixels. so I either use iTunes to retrieve the album cover or search for better art using sloth radio. UPDATE: 4 Dec 2008: However, a recent redesign of the site does provide high-quality album art in the browser. It must still be manually added to the music files, but at least it’s right there when you download an album. Winner: Slight edge to Amazon for embedding the art, slight knock to eMusic for making me work to find better art. The iTunes Store provides free content across its entire product line, from TV episodes to movie clips to sample audiobook chapters and of course, music, not a day goes by without some kind of freebie posted and available for consumption. Most notable is the Single of the Week, which changes every Tuesday. There are entire websites devoted to tracking the latest zero cost offerings at the store. Likewise, eMusic also offers free downloads. You don’t even need to be a customer to snag them. eMusic offers two types of freebies. One, the Daily Download is updated every day. Other, long term free tracks are kept in their own part of the site. At the time of this writing, there are roughly 70 tracks up for the taking. Since eMusic caters to those outside the mainstream, most of the free tracks are from the relatively obscure, so if you’re looking to explore a bit, here’s a chance to do so without spending a cent. I’ve not found much zero cost music at AMZMP3. There’s certainly no breakout section saying “Free Downloads Here.” However, the list of every available MP3, sorted by price , reveals a total of 36 songs available free of charge. The store is young, so who knows what kind of free stuff is planned for it. Winner: Each store has something to give away, but eMusic gains an edge by not even requiring an account to download it. iTunes has a lot of variety, plus the entire podcast directory and iTunes U, so mucho bonus points there. Amazon lags at a distant third. In terms of service, the stores are fairly evenly matched. Some foibles here and there, but, hey, nobody’s perfect. Amazon is a worthy contender and an appealling place to look when you just have to have a song right now. eMusic pretty much rules for those who enjoy exploring off the beaten path. But if you want to be absolutely sure to find the songs you’re looking for, iTunes can’t be beat. You just might have to pay a premium for the convenience and hope it’s not poisoned with DRM. Personally, I find each to be a fine service and I see no reason to exclude any of them from my music-buying arsenal. In fact, I look forward to using Amazon a little more. And maybe, just maybe, the pressure will drive those other two companies to improve their digital music services. Note: In the interest of disclosure, you should be aware that tunequest acts as an affiliate for two of the stores mentioned in this article. They send me a pittance whenever I send them a customer. However, that relationship in no way changes my opinion of each company. The fact is that I would not have chosen to become affiliated were I not already impressed with the services in the first place. They each have their strengths and weaknesses. This song is perhaps the greatest mystery in the entirety of my music collection. It’s a fairly sophisticated remix of the song Twift Shoeblade from Mouse on Mars’ third album Autoditacker (1997). The tempo is a little faster, the arrangement has a little more punch and it has been resequenced slightly. Not to snub the original at all, but I must say I pretty much prefer the remixed version. The strange thing is, in the seven years I’ve had it in my collection, I’ve never been able to track down any information about it. If I could remember where I got it, that might help, but honestly, I have no idea where I it came from. The song is old enough that it could be from the original Napster, but either way, that wouldn’t help. Still, even armed with this information, I’ve been able to track down nary a clue about its origin. Google is completely useless, turning up seven results for the phrase “turn the dark up,” most of which are about theater. Searches for “The Big Chopper” and “Mixed by the Big Chopper” don’t reveal much either, mostly with regards to motorcycles. I’ve found one music-related reference at musician and noted producer Don Flemings’ Instant Mayhem, but Surfin Halloween doesn’t sound anything close to what I’m looking for. The iTunes Store has a rapper by the name of Big Chopper, but I don’t think that’s it either. So, whoever you are, Mr. Remixer, I salute you. I guess this is one riddle that will have to remain unsolved. And to all you readers, here’s a treat: Turn the Dark Up, mixed by The Big Chopper. Enjoy. Where does the time go? It seems like just yesterday, my friend Dan was imploring me to give Radiohead a shot. At this point in the band’s career, I had been less than impressed with their offerings. Don’t worry though, I came around. To celebrate OK Computer’s decennial, Hypeful has compiled every song on the album, each covered by a different artist, as downloadable mp3s. I’m not sure which is the most intriguing, Shawn Lee’s quasi-soul adult contemporary rendition of No Surprises or the String Quartet version of Electioneering or The Illuminati’s glitched and distorted interpretation of Subterranean Homesick Alien. For my money, I think it’s Silent Gray’s inexplicable rock recording of Fitter Happier. Of course, none of them improve on the original, but after ten years, the new perspectives are refreshing. But if imitation and inspiration are the sincerest forms of flattery, then the existence of these covers goes to show the extent of OK Computer’s legacy. Update July 10: Not to be outdone, stereogum has compiled its own unique list of track-by-track OK Computer covers. This further demonstrated the impact of the record. It’s astonishing that it would be that easy to pull together, from existing sources, TWO complete cover records featuring 24 different artists, with no overlap. I spent a portion of this Saturday going through my extended archive of music, the stuff that’s not in my central, everyday iTunes library. Most of those files are a bit old and for either quality or tagging reason, they’ve been left unincorporated. Some of these songs have been sitting untouched and unlistened to on cds and hard drives for years. So I’ve decided to start sorting and evaluating them for re-inclusion into the main library, checking the ID3 tags, bitrates and such to make them conform to my standards. And of course, I’m making sure I still actually like the song. In the case of this one particular song, Bjork and PJ Harvey covering the Rolling Stones’ Satisfaction (I Can’t Get No) at the 1995 Brit Awards, I was sure it would be gangbusters. Turns out it was lacklusters. I didn’t much care for it. Somehow, they mangage to go over-the-top without doing anything at all. So I’m deleting it from my collection. But not before I give it away. If eight-year-old mp3s are your thing, and the prospect of a Bjork/PJ Harvey duet makes you salivate in anticipation, download away. So, by now, large portions of the internet are abuzz with the Federal jury decision that Microsoft has been violating some of Alcatel-Lucent’s patents on the MP3 file format, which ahas been the backbone of the digital music revolutions and without which iTunes and the iPod would not have been possible. just what the are all the MP3 patents, and when do they expire? I can’t really speculate to that first point, but for the second, it’s fortunate that Thomson, the company that handles MP3 licensing has a neatly compiled list published at mp3licensing.com. Of the twenty patents listed there, eighteen are filed in the U.S., to which this list is limited. These are the patents that everyone who makes an MP3-related product has licensed. We’ll get to those. First though, here are the Alcatel-Lucent patents that Microsoft was found guilty of violating. This information was taken from the US Patent and Trademark Office. Since I’m no patent attorney, all expiration dates are best guesses based on quick summary research. Changes to U.S. patent law and the GATT treaty in the mid-90s (while mp3 was being developed) complicates matters. Additionally, I have not a clue as to how to handle continuations of abandoned applications, so some of these could be way off. If anyone more knowledgeable wishes to correct any of my guesses, I will happily revise this page. These are much too technical, both in legalese and technology for me, but still I find them fascinating from a layman’s point of view. Volkher at livingwithmusic posted the other day a rather thoughtful treatise against digital music files as a medium. He does a good job of bringing up all the relative shortcomings of abandoning physical media, including the effort required to encode/download and properly organize/tag files as well as the burden and cost that goes into storage and preventative backups. And he’s right on the money about picking an audio format that may or may not be around for the long haul. It’s a valid argument; you should go read it. But as one of those “young folks” who’s been living with mp3s and related files for 10 years now, I’d like to offer a friendly rebuttal, because digital music files do have much to offer, despite the occasional hassle. Firstly though, I’m going to side-step rights-management and other DRM-related issues. It’s quite possible to build a large collection of digital music and never touch the stuff. Plus, with all the talk lately about eliminating DRM from the marketplace entirely, it may well not be an issue in the near future. Carrying on then, why embrace digital music? In my case, the number one reason is convenience and flexibility. Using iTunes, it only takes a handful of clicks to set up a playlist that will last all day. That playlist will only include songs that I like, ignoring ones that I might not care for. I can listen to one hundred different artists as easily as I can listen to Radiohead’s complete discography, including live shows and unofficial tracks. No need to organize or hunt for physical CDs, or interrupt the music to change discs or skip ill-favored songs. With some extra up-front effort and Smart Playlists, I can turn my library into a self-refreshing and randomized jukebox that I can assume control of at any moment. With an iPod, I can take it all with me, wherever I go. It truly is awesome stuff. Another reason I enjoy digital music is the physical space savings. I still have a large number of CDs, even though the vast majority of my music listening is done via iPod or iTunes. Finding a place to put all of those discs has proved challenging and, after 19 months of living at my current house, most of them are still boxed up and hard to access. That’s fine though; they can stay in the garage/closet/attic because I already have everything I need on my hard drive. Additionally, expandability is a significant motivation for taking to digital music. As a physical collection grows, the tyranny of the shelf kicks in, which ultimately limits the collection’s size and imposes increased time-overhead on organization and media retrieval. iTunes offers no practical limit to the number of songs it can manage. Hard drive space and memory are the only true limitations (though a computer’s processor speed can become an issue, especially if there are a large number of live-updating Smart Playlists). Currently, I’m storing about 18,000 files (between my library and my wife’s) + a backup drive in the same physical space as about 6 CDs. I could double the amount of songs and hardly use any more desk space. Of course, this digital utopia is not without its pitfalls, many of which Volkher mentioned. Number one, by far, is data security and integrity. Hard disk drives are notorious for failing, whether though a mechanical fault or corrupted disk header. And they usually fail inexplicably and at exactly the wrong moment. A hard drive crash can obliterate a library of thousands in an instant, often with no warning whatsoever. I know; it’s happened to me on multiple occasions. By contrast, a scratched CD might lead to the loss of that CD and nothing more. Thus, a workable, redundant backup system is necessary to protect against irrevocable and irrecoverable catastrophe. The cost and effort of doing that, of course, increases with the amount of data to be backed up. A 10GB library is easier to deal with than a 100GB. At 128kbps, the bitrate of standard iTunes-purchased AAC files, one terabyte is 18,641.35 hours / 776.73 days / 2.12 years of non-stop, continuous music listening. At 191kbps, the average bitrate in my library, one terabyte is 12,492.63 hours / 520.53 days / 17.1 months of continuous listening. That number is about 11 times the size of my current library. Suppose you’re a true audiophile and only deal with lossless encoding, such as FLAC or Apple Lossless format. The average bitrate of all the lossless songs in my library is 728kbps, which is still nearly 3,277.6 hours / 136.6 days / 4.48 months worth of continuous audio. *these numbers do not take into account file overhead, album art, etc. However, it seems pretty clear that one terabyte will hold a lot of music. You’d have to own a seriously HUGE collection (roughly 4000 full-length CDs, lossless compression; 7500 CDs, extreme quality 320kbps mp3s) before a terabyte is a serious option for the working copy of your library. I know there are people who can claim those numbers, just not the vast, vast majority of music listeners. Heck, I consider myself a respectable avid collector/listener/explorer of music and it took me a full year to listen to each and every song in my library, a library that is the equivalent of ~1400 full-length records. Hard disk storage is cheap and getting cheaper. Practically speaking, two 500GB drives would sufficiently provide enough storage for a live copy and backup of all but the most copious of collections. Add a third for redundancy, if you’re paranoid. At $230 a piece as I write this, the cost of the drives compares favorably to all the shelving and organizational furnishings needed to manage a large physical collection, even those from IKEA. That number is based on the assumption that a digital library consists entirely of full CDs. When considering partial albums and single tracks, the space savings is even greater. The single track of Nate Dogg and Warren G’s Regulate in my library actually saves me the full 11mm of space rather than .917, since I don’t have to own the full album just to have that one song. Despite my continued devotion to the digital music scheme, I must admit that I do miss some of the concrete and tactile aspects of handling a physical record or compact disc: album art, liner notes the satisfactory “click” of snapping a disc into place and-contrary to what I’ve said above-the awesome feeling of standing back and viewing a neatly organized array of records on shelf after shelf. But at this point, for me, it’s all digital and there’s no going back. Volkher goes on to discuss the inherent uncertainty of choosing an audio file format that may or may not be in use and supported by audio devices in times past the immediate future. And he’s got a valid point. I know from experience. Long ago, a portion of my digital music collection was in the MP2 format, which was largely made defunct by the growth of MP3 tools and players. The death knell for me was the iPod. I was dismayed when I bought my first one and discovered that it didn’t support MP2, forcing me to convert those portions of my library into something more usable. So futureproofing is an ever-present concern. But, like the compact disc and vinyl record, there’s no reason to believe that mass-market digital formats won’t be around for a very long time. The use of MP2 was never really widespread. MP3 and AAC however have users in the tens of millions. Many people and many companies have invested a lot of resources into those formats. They’re not going to die any time soon. In fact, the patents on the MP3 format begin to expire in 2011, just 4 years away. I’d wager that individuals, corporations and open source communities will have a field day with it in short order, continuing to breathe life and support into software and hardware for decades. Look at the passion with which gamers and code archivists continue to resurrect, port and support obsolete games. Just yesterday I ran across a 30+ year old command-line game called Super Star Trek that certainly would not be playable on today’s technology. But thanks to the efforts of a dedicated user, there is now a refreshed version for Mac OS X, Windows, Linux, OS/2 and DOS. Likewise, I expect that in three decades time, I will fully be able to enjoy my collection, no matter what size it has expanded to. I believe that the flexible nature of software will make it easier to maintain support for these formats as they age, unlike hardware-dependent media (I’m looking at you, reel-to-reel, 8-track and increasingly, cassette tapes). The fact that I was able to easily convert my MP2 files to MP3 is a strong argument for digital files. Just try converting a reel-to-reel tape without a reel-to-reel player. I admire Volkher’s decision to keep his music in the real world; I know there’s no better feeling than finding an old, rare, long-sought-after gem. But for me, the future is all digital. It has its trappings, but they are easy to overcome. The rewards outwiegh the risks. So, now if you’ll excuse me, I have a playlist to build.